Epithelioid Mesothelioma is the most common and relatively treatable form of the cancer. Between 50-70% of mesothelioma cases fall into this category, and this type is most likely to respond to treatment. In order to diagnose a case of Epithelioid Mesothelioma, a biopsy is required. Epithelioid Mesothelioma cancer is the most common type of mesothelioma cancer cell. The individual cells have a unique pattern. They are relatively uniform in shape with a tubular pattern and a distinct cell nucleus under high magnification. Other types of cancer can also take a similar form, and if these cancers appear in the mesothelium, then they can be confused with Epithelioid Mesothelioma. Adenocarcinoma is a type of cancer often confused with epithelioid mesothelioma. A biopsy I is needed to remove a section of suspect tissue for examination to determine a diagnosis. Adenocarcinoma is a type of epithelial cancer that originates in the body's glandular tissue. Adenocarcinoma often presents itself as a benign glandular tumor (adenoma) that develops into a malignant state over time. Epithelioid mesothelioma and adenocarcinoma are both rooted in the epithelial tissue, and as such, have a similar cellular structure. Chemical staining of a section of suspect tissue will often yield the correct diagnosis; however, chemical staining of Epithelioid Mesothelioma cells and adenocarcinoma cells sometimes elicits similar results. Knowledge of a family history can often help aid in distinguishing between adenocarcinoma and Epithelioid Mesothelioma. If a patient has a family history of carcinoma, it is more likely that they suffer from a variant of the disease. 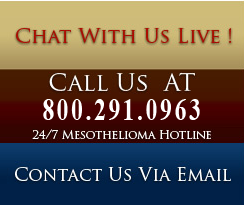 If a patient has a history of asbestos exposure, it is more likely that they suffer from Epithelioid Mesothelioma.